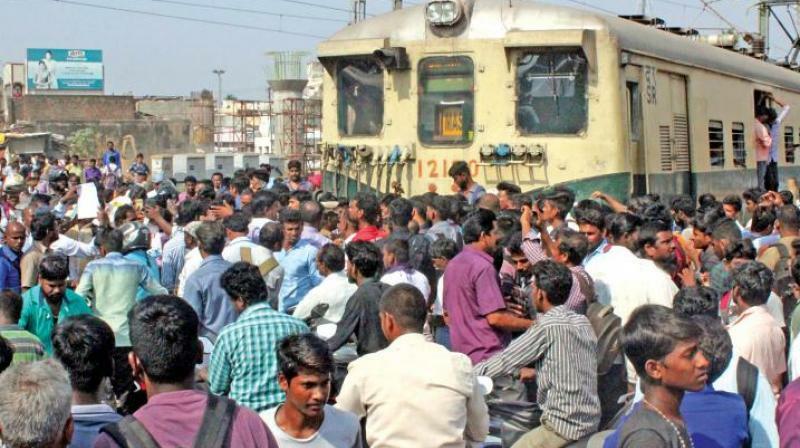 Kolkata: Angry passengers put up a rail blockade at the Sodepur station in North 24 Parganas during the peak hours on Saturday morning and vandalised the station master’s office, alleging wrong announcement of trains. Twenty EMU locals were cancelled due to the disruption. According to the passengers, the announcement of arrival of Dn Ranaghat Local was made through the public address system after it left the station. Agitated passengers jumped down to the tracks, blocking train movements. Some of them attacked the station master’s office and went on a rampage. The railway protection force and government railway police personnel tried to control the mob but in vain. According to the eastern railway (ER), train services were disrupted on Sealdah main line section due to the rail blockade which started at 9.46 am till 12.30 pm on Saturday “against late running of trains”. “The obstructers pelted stones at the station master’s office and damaged office furniture. Normal train services were resumed on the Sealdah-Ranaghat section when the obstruction at Sodepur station was lifted at 12.30 pm. As a result of the obstruction, 3 up and 21 down EMU trains had to be halted en route for two-and-a-half hour each on an average,” it elaborated.